So I am soooooo close to being done with my major project of the last year. You may remember me talking about this huge project of turning an oversized guest bathroom into a smaller bathroom and third floor laundry room. Having the laundry on the same floor as the bedrooms has been a game changer for me. Plus it has stretched my DIY skills by teaching me how to frame, drywall and mud. The new bathroom size is 7’ x 11’ and it was 11’ x 11’. So I had the option of doing a larger shower and smaller vanity or larger vanity and smaller shower. There was a big difference in size as far as the shower was concerned. It was either a 36” or 48” pan. An extra 12” of room is huge in a shower. Plus I didn’t want to pour a custom shower pan, my DIY skills were already stretched enough . So I opted for a larger shower and a small vanity area. So I framed in a wall for the shower surround to go which only gave me 29” of space for a vanity. All the vanities I found were like 24” or 28” and I knew the extra inches on the sides would bug me plus I wanted to have as large of a vanity area as possible. So I decided to build a floating vanity like you see in higher end hotels. It was very simple an super inexpensive. 1. I started by measuring the width of the sink area and then I decided to go a little deeper than standard vanities and went 25” for the depth (plus the face frame made it 26 1/2”). Using a table saw I cut my piece of plywood to fit that area. 2. Next I grabbed a pine 2” x 8” and ripped it down to 6” for the face frame on the vanity. I didn’t worry that it is pine and birch mixed. It turned out fabulous once stained. 3. Using the sink template (I purchased this stock sink from Lowes) and a jigsaw I cut out the circle for my sink. Sand with 150 grit sandpaper with an orbital sander to give both pieces of wood a nice smooth finish ready for stain. 4. I used a pre-wood conditioner on the pine board since it is a soft wood. Then I applied my stain. I used Minwax Dark Walnut. I had to go over the pine board with a couple of coats to get it to match the birch piece. I let it dry overnight. 5. With an old t-shirt scrap I applied the General Finishes Top Coat. I let it dry 24 hours between coats and then I lightly sanded in between coats with 400 grit sandpaper. I gave it 4 coats. 6. Then I cut out (3) 2” x 4” pieces. 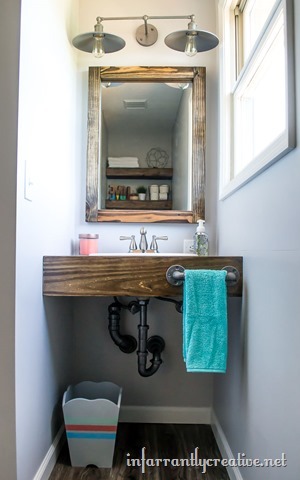 One board was the width of your vanity top. Then I cut two more 1 1/2” less than my vanity width. I drilled two pocketholes on each end of the last two boards I cut. 7. I found the studs and then used 2 1/2” screws to screw the back board in place. Then I used pocketholes screws to attach the two boards to the back piece. I marked the studs on the side wall and used 2 1/2” wood screws to secure those to the studs. This gave me a very sturdy base for my vanity top. 8. At this point I nailed my vanity top to the frame but I could have added pocketholes previously to my 2 x4 boards and attached it that way. Either works. But nails did require some touch up stain and top coat. 9. To add the face frame I used 2 1/2” Kreg screws into the side 2” x 4” supports to attach to the back of the face frame. 10. I used wood filler to touch up the holes. 11. I sealed the sink with caulk (I opted for white to match the sink). Then I sealed the area where the vanity top meets the wall with clear silicone caulk. 12. Optional: I decided to leave the pipes exposed. Since they were white PVC pipes I taped off the whole area and used RustOleum Steel Metal on them. I was reminded why I don’t purchase RustOleum. I loved the color but I got two defective cans and had to go to the store twice to return them. UGH! I should have stuck to my trusty Krylon. I love the way the pipes turned out though. The color is very authentic to regular pipes as evident by the pipe hand towel bar I made with 3/4” elbows, 1 1/2” connectors, 3/4” flanges and a 6” pipe. The vanity area is small but I think it is perfect for a guest bathroom. And I absolutely love the dark wood vanity top paired with the gray tones in the Aquaguard flooring and the white trim. Oh and here is a SNEAK peek of the mirror I made with all scrap wood so it was totally FREE! More on that soon!